Sin palabras . . . Lindas piezas. Feliz 2015 para todos los que escriben a esta página. I’m trying to determine the date of fabrication of a Citizen watch that my grandmother gifted to my grandfather, and now he gifted me. I think she bought it between the 70s and the 80s. On the back side it says: T178 (below) CITIZEN (below) WATERPROOF (below) 0 2818 (below) 808017767. Hi Gonzalo, thanks for visiting my blog. 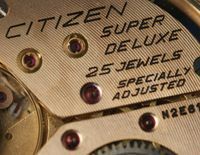 From the description of your watch, I believe it is from the late 1960s, so a little older than you have thought. 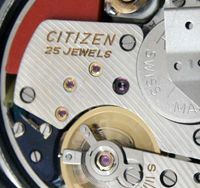 Since it is marked ‘waterproof’ if was made no later than the early 1970s (when all watch makers had to change to ‘water resistant’). I don’t think ‘parashock’ was used after the 1960s, and Auto Daters were also from the 1960s, so it seems to me to be earlier than 1970. 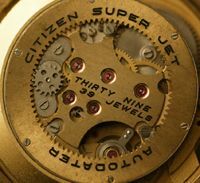 The first three digits of the serial number (808) give the production date, in order of year and month so it is August 1968. I’m puzzled by the other numbers on the case back (T178 and 02818). I would love to see photos of the watch if that is possible – photos can’t be posted here by visitors but if you have any I can email you and you could send them to me for me to upload (no need to post your email address I see that when a comment is made). Thank you very much for the information! I would be glad to take some pictures and mail them to you, just send me an email. 3) My grandfather told me that because of some reason the front glass was removed and put in place again, and that ever since its no longer waterproof (he told me that if I submerge it some water might get inside). 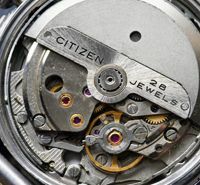 You’re welcome Gonzalo 🙂 It may be the watch just needs stripping down, thorough cleaning and oiling – hopefully that would cure the short power reserve when the watch is not on your wrist, and maybe resolve the problem with the crown and setting stem too. Parts are very difficult to source if they are needed, but it’s not always impossible to find stuff. 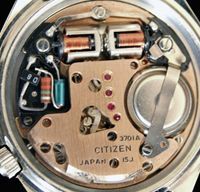 Once I see your watch pics I should be able to identify just what movement is inside (email just sent). I’ll see if I can get a recommendation for someone in your country for servicing – if that fails I can recommend someone in the UK you can try.